It was the first time that we had exhibited at the annual BBKA Spring Convention at Stoneleigh Park this year which was a huge success. 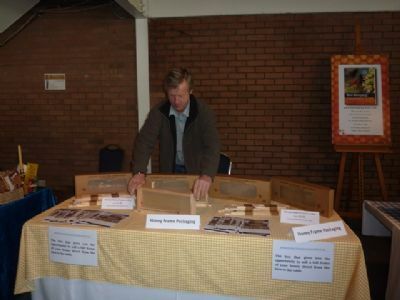 The one day trade show is part of the annual British Beekeeper's Association's three day convention, which is by far the largest show of its type in the UK. Several thousand beekeepers attend each year hoping to find a bargain - of which there were many. Sales were brisk all day with new customers keen to sell their honey as a full frame. More exciting was the fact that I had several repeat orders coming in from customers who purchased my boxes at the National Honey Show last October when we launched. One customer who was a repeat purchaser, had sold all his frames of honey during the Christmas period last year for £50 per frame. As a result he wanted more. This just proves that the system works. I had two buddies either side of my stand at the show. The first being Min Morgan selling her wax candles www.dragonsbreath.eu and David Wootton who was promoting his new bee book for novices. www.dw-photography.co.uk . Between us we looked after each others stands during the few quiet times we had. Since returning home, online sales have picked up well from people who attended the show but didnt commit on the day. More and more beekeepers are now venturing out into sell their honey as a full frame instead of cut comb. It makes so much sense as its more profitable, less hassle and no sticky extracting of honey.